You may think that the MMRS only has members who are all experts in some way or other. Well, there are some expert members, but many of us are ordinary modellers who want to improve by seeing what can be done and by talking to those who can do it. If you are interested in becoming a member or just finding out more about us, contact the Membership Secretary (Geoff Godsell membershipGG@mmrs.co.uk) and he will arrange a mutually convenient time for someone with similar interests to yours to show you around. Opening times are listed on the Dean Hall page. Apart from a large stock of books, we have these magazines: Railway Modeller, Model Railway Journal, Model Rail, British Railway Modelling, Hornby Magazine, Gauge 0 Guild Gazette, Model Railroader, Narrow Gauge and Short Line Gazette, Back Track, Steam Days, Steam World, Locomotive Illustrated, British Railway Illustrated, Lancashire and Yorkshire Focus, Great Western Railway Journal, British Railway Journal, LMS Journal, Bylines, Railway Archive, British Railway Modelling, Railway Magazine, Continental Modeller. Many of these magazines go back to the first issues and other magazines such as Model Railway Constructor and Model Railway News are also in stock. These alone could save you more than the cost of membership. Of course you may just want to sit and have a cup of tea whilst chatting to like-minded people, or admire the latest developments on our layouts. If you like what you see and want to join us, print off a membership application form and post it to the Membership Secretary – full details are on the form. 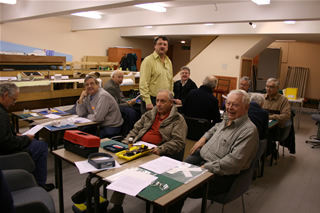 Visits in recent years have included Preston 0 Gauge Group, Hull Miniature Railway Society, Mike Norris’ P4 Preston layout and four visits to Pete Waterman’s 0 gauge layout. As well as access to our layouts, membership entitles you to free entry to the annual exhibition, regular talks and visits, use of the workshop and library at Dean Hall, and receipt of our monthly magazine “The Link” (see below). Membership is £67 a year. There are no separate attendance costs. Joining part way through the year (which runs from September to August) leads to a proportional reduction. The mutual improvement classes have proved to be a big hit with members who want to avoid making lots of mistakes by having an expert on hand to provide guidance. Recent courses have included introductory and advanced soldering, working in styrene (pictured), resin casting, painting and lining, model signal construction. The one-day courses listed below are generally available to members, given sufficient numbers wanting to take part. The aim is that someone who takes a course will learn through guided practical experience rather than by listening to a lecture or watching demonstrations. Courses for the Myford lathe and profile miller are also available on the same ad hoc basis but generally need to be one-to-one and over a longer period than one day. The workshop also has two smaller lathes but any teaching will normally use the larger Myford ML7. 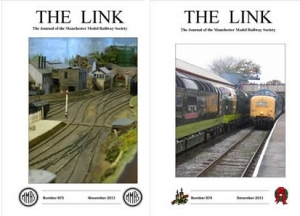 Our monthly magazine “The Link” keeps members in touch with current issues in the Society, carries articles of general interest to the railway modeller and notices of other specialist societies’ meetings, some of which are held at Dean Hall. The Link is considered to be a leading example of this type of club magazine ever since its first issue in July 1934.